Omega-3’s are critical to human health and are incorporated into every cell membrane to improve activity in the brain and nerve health. Pure Omega 900 is a professional formula that will support your cardiovascular health, improve cognitive function, and reduce inflammation. Pure Omega 900 is backed by physicians because of the purity, potency and effectiveness of the fish oil and because it meets international fish standards being free of heavy metals radiation and other contaminants. Pure Omega 900 is International Fish Oil Standard (IFOS) 5 star certified. Which assures the highest level of purity, potency, and stability. IFOS certified provides our physicians with peace of mind knowing they are giving their patients only the highest quality oils on the market. Omega 3 fish oils are inherently unstable and prone to oxidation. IFOS’s proprietary extraction and delivery ensures clean, potent, and quality oils. Pure Omega 900 utilizes a patented enteric coating on each fish oil capsule. Enteric coatings are designed to increase absorption by bypassing the acidic environment of the stomach and deliver therapeutic doses into the intestinal environment. This increases absorption and bioavailability compared to other competitors by delivering IFOS certified oils directly into the small intestines before being metabolized where fat absorption occurs. Additionally, enteric coatings reduces the occurrence of fishy aftertaste, a common complaint of fish oils. Fish Oils are a potent source of Omega 3 fatty acids, including EPA and DHA. These fats have been shown to block inflammatory causing cytokines in the body. Cytokines are cellular messengers that can activate an inflammatory cascade. Omega 3 fatty acids work to block these cytokines preventing uncomfortable inflammation. Omega 3 fatty acids have also shown to lower blood triglycerides (fats that circulate in the bloodstream). This may help lower the risks associated with cardiovascular dysfunction. DHA, found in Pure Omega 900 in generous therapeutic dosing, has been widely studied for its beneficial effect on neuronal developments, brain and cognitive functions, as well as memory and concentration. Pure Omega 900 should be a cornerstone to any health and wellness program. Get your bottle today! Omega-3 concentrate is a top notch exceptionally fresh raw fish oil. Exclusively sourced from US-caught fish that is processed within hours. The main fish sources are certified sustainable wild Alaskan walleye pollock and Pacific whiting obtained from the cold, clear waters of Alaska. Cold extraction further concentrates the oil while molecular distillation removes fishy odor and taste resulting in extremely fresh oil. A filtration process is also used to remove PCB’s, pollutants and toxic heavy metals. GRAS-Certified Enteric Coating is essential to guarantee quality and delivery to the small intestine before being metabolized. Pure Omega 900 uses a fish gelatin softgel that is enteric-coated and GRAS-certified. The result is better delivery to the intestines and therefore better absorption. This method also reduces the occurrence of a fishy aftertaste. Ethyl Ester Form of omega-3. 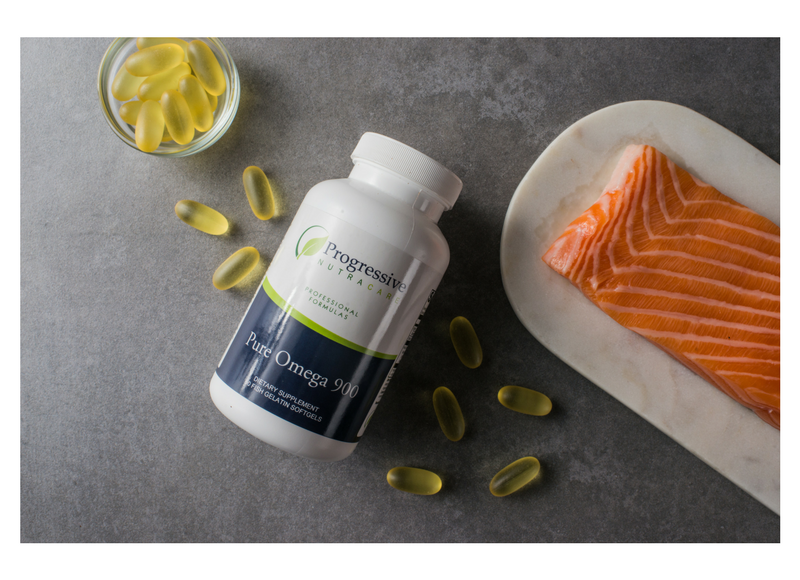 Research has shown omega-3 fish oils provided in ethyl ester form tended to have less of an impact on increasing LDL-cholesterol levels compared to the omega-3 fish oils delivered in in the triglyceride formula. Pure Omega 900 is a nutritional supplement intended to provide a therapeutic amount of EPA and DHA fish oils in a state of the art delivery method. Pure Omega 900 is for individuals looking to support anti-aging, cardiovascular health, brain and nervous system functioning and joint health. Those who want to improve their cognitive function, improve eyesight and cardiovascular health or have inflammation and are looking to improve achiness and joint issues. Pure Omega 900 is intended to take 1 softgel daily or as directed by your healthcare practitioners. Individuals taking blood thinners should consult their healthcare practitioner prior to use.